Rhino specialise in shrink wrapping scaffolding structures. We supply scaffold shrink wrapping materials, equipment and shrink wrap training and we also have two shrink wrap installation teams who provide a full ‘supply and fix’ service. Rhino Shrink Wrap’s Founder & MD, Steve Irlam talks openly about how Rhino Shrink Wrap came to be established, the secret of scaffold wrapping happiness and what makes him mad! How did you first get involved with shrink wrapping? I started my first industrial shrink wrapping company called ‘PlasWrap’ in 2009. We were just a small team with everybody ‘on the tools’; even my Dad helped out on occasion! At that time we bought our shrink wrap from a distributor in the South of England and after a couple of years we were using many tonnes of shrink wrap every month so they asked me if I was interested in setting up a ‘joint venture’ and creating a specialised scaffold shrink wrap installation division for them. I set up the new scaffold wrap installation division for the distributor and quickly grew the team to 10 installers working for scaffolders and contractors all over the UK. However, I became frustrated with the quality of the shrink wrap that I was using; welds or joints between sheets came apart easily and it was difficult to heat shrink the scaffold wrap ‘drum tight’, especially in wet and breezy conditions. It was frustrating to see scaffolders who had been trained on the scaffold wrap installation process struggling with the product and in many cases just giving up with it. It was hard to make those responsible for product quality see what problems this caused for our installers and customers at the ‘sharp end’ and they had never experienced the horrible feeling of not being able to sleep at night when it was windy. So, in 2014 I established Rhino Shrink Wrap. Finding a shrink wrap film tough enough for the job proved to be a challenge as all the scaffold shrink wrap suppliers I found via the web, even those who claimed to be the ‘manufacturers’, in reality were just distributors for ‘mass market’ plastics manufacturers. This meant the distributors had minimal control over the quality of the film that they received from the manufacturers which meant the quality could vary from roll to roll, there was no consistency. Eventually I met Gommaar Timmermans of Verisafe® in Belgium. His background as a chemist in the plastics industry led to the development of a shrink wrap film that was specifically engineered for scaffolding & construction. Not only that but Gommaar worked with the BRE in the UK to achieve LPS1207 and LPS1215 flame retardant certification which meant it was the only shrink wrap film to be approved by the insurance industry for use on construction projects. I gave the first few rolls of Verisafe® to our own installation teams to try out in the summer of 2014. 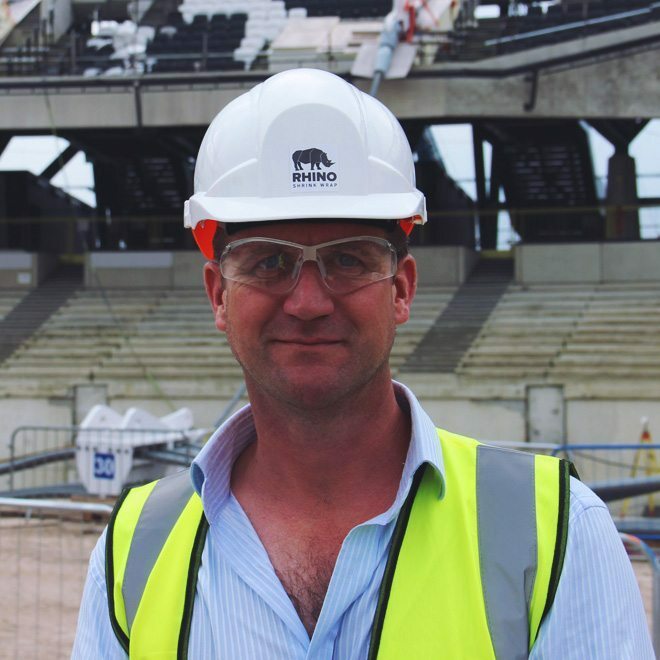 At that time we were building 168 shrink wrapped ‘pods’ high around the roof of the Olympic Stadium in London. The trial was a success, the wrap welded easily (and stayed welded without taping) and shrunk off tightly, even in breezy conditions. Since then business has been expanding month by month as we have carried out installation work and started supplying the shrink wrap rolls to customers who carry out their own shrink wrap jobs. I’m inspired by people who work hard. I am very aware that scaffolding and the construction market is highly competitive so it is great to see our customers’ businesses expanding and to play just a small part in that. What does Rhino stand for? 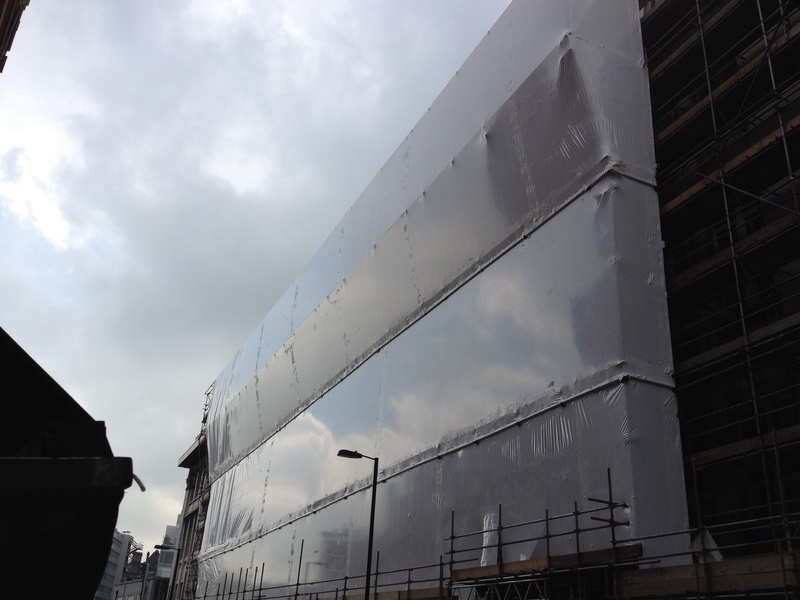 Scaffold shrink wrapping is a speciality trade and a relatively new product. I believe in providing our customers with a comprehensive knowledge base (see our free resources) so that they have the best opportunity for success. Even if somebody doesn’t buy from us I want to make sure they have the information to make the right choices. We also stand for honesty – If we can’t do something, we won’t say that we can then call you at the eleventh hour to say we can’t and we never supply any products that we don’t use ourselves. What is the biggest kick you get out of work? I’ve been particularly pleased about positive feedback from scaffolders who have also used competitor products. When professional users recognise the quality of our products, it makes the effort to develop them worthwhile. 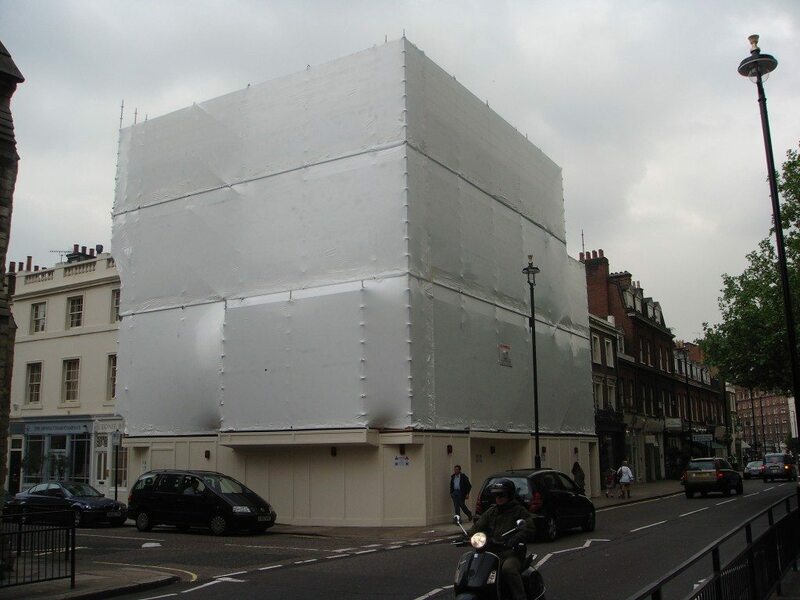 What is the secret to a shrink wrapping a scaffolding successfully? Successful job involves combining a great product with great installation knowledge. Shrink wrapping a scaffolding can be a very demanding and challenging application for a shrink film, and to do it successfully needs a shrink film that has been ‘engineered for purpose’. I would advise people to be to be quite sceptical regarding many of the claims that companies selling shrink wrap for scaffolding make. Much of the scaffold wrapping film on the market is simply general plastic shrink wrap that is being branded and marketed as scaffold wrap. I don’t believe shrink wrap is the best solution to every single situation where weather protection and containment is needed. Traditional scaffold sheeting products like ‘Monarflex’ and the various roofing systems are great. However, for anyone considering shrink wrap they should give Rhino a try because they will get an engineered and consistent product, supplied by knowledgable people which makes maximises the likelihood of their job being successful. Oh, and we cost no more than the low quality suppliers! Who do Rhino Shrink Wrap work for? We mostly work with scaffolders. In many scaffolding companies we work directly with the owner of the company, or sometimes we might work with a contracts manager or estimator, especially in a larger scaffold company. Scaffolding is a tough, no nonsense business which reflects our products. We give scaffolders the tools they need to be successful – an engineered product and installation knowledge and technical support. We also work with construction contractors, generally a project manager or a contract manager. For these main contractors we generally provide a fully installed service and we have carried out many large and high profile projects where the highest level of professionalism and safety is required. (you can check out some case studies here) We are able to provide in depth evidence of our employees competencies and product certification. I suppose it could be argued that we compete with traditional scaffold sheeting, (the type that is attached lift by lift with bungee cord), but I think of shrink wrap for scaffolding, not as a replacement for traditional sheeting, but for applications where a higher level of performance or more professional appearance is required. 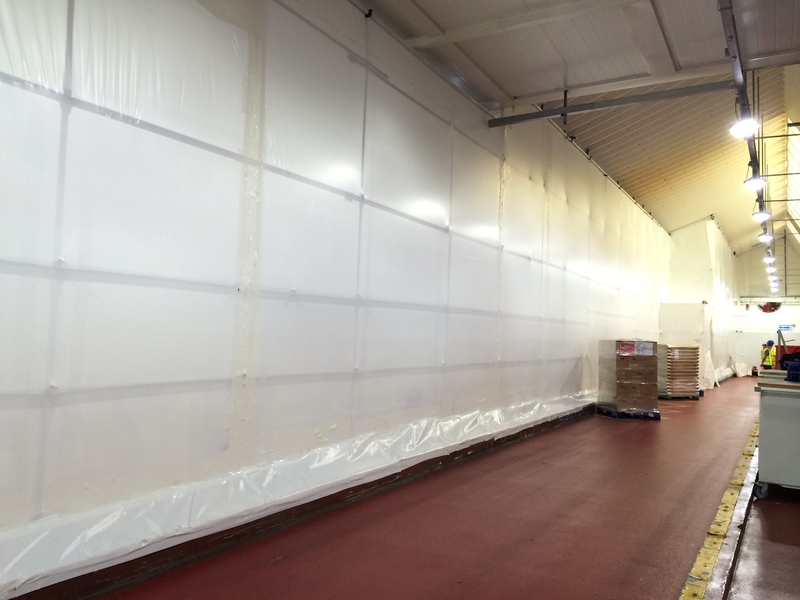 Our biggest competitors are the general packaging plastic suppliers; These companies buy general plastic shrink wrap sheeting and then selling is as scaffold wrap which means that most of the distributors have quite low levels of control of the quality of the film and the quality can vary between batches. The frustrations I have are probably shared by all of us who work every day in the construction industry. On the installation side of our business, customers who tell us to come to site and we pull out all the stops to get there only to find that the project is not ready is very frustrating. On the ‘supply only’ side of the business I get mad when suppliers who have never set foot on a scaffolding or a construction site decide that they can take some general plastic sheeting and then sell it as ‘scaffold wrap’! What is frustrating is that they don’t understand the problems that it causes. When it blows off or doesn’t perform somebody has to go back and fix it, and that someone is not the person sitting in their lovely warm office who sold the shrink wrap! What is the purpose of the new Rhino Shrink Wrap website? Although shrink wrapping has been used for scaffolding in the UK for the last 15 years, it is still a relatively new and unregulated industry. The Rhino web site is designed to be a comprehensive resource for anybody interested in using a shrink wrap sheeting for scaffold shrink wrapping. My aim is to educate and inform. We like to sell our products too of course but if we educate, then the whole industry benefits. 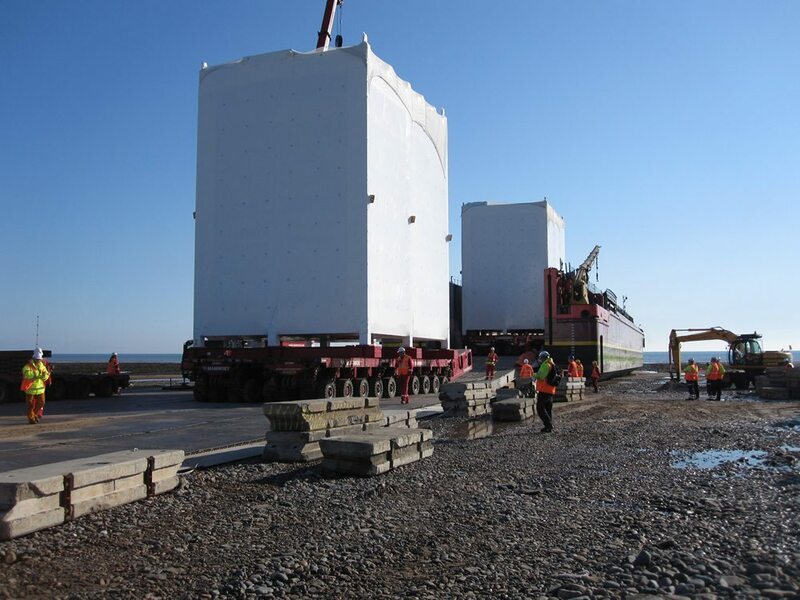 No, because we don’t want to compete with our customers and it enables us to focus 100% on scaffold shrink wrap sheeting and it’s application. Our installation team are on construction sites every day so we understand about the realities of ‘life at the sharp end’ for the scaffolders and contractors we work with.